A confluence of car enthusiast clichés has been given life, and we are now but humble servants to a new patron saint of Talking About Cars Online: the 2019 Audi S6 Avant TDI. The new diesel-powered mega-wagon of your dreams claims 516.3 lb-ft of torque, 36.2 mpg on the highway, and a payload capacity of 1,400 pounds. If you’re reading this in America, like, statistically, most of our readers are, this car will unfortunately have to remain in your dreams. Apparently it’s only for sale in Europe, because reasons. But I’m not sweating it, since I couldn’t afford a new Audi anyway. For the handful of people who stumbled onto this blog post from somewhere outside circles of the car-obsessed, we like diesels for their power, efficiency and durability. We like performance wagons for their combination of sporting pretenses and practicality. 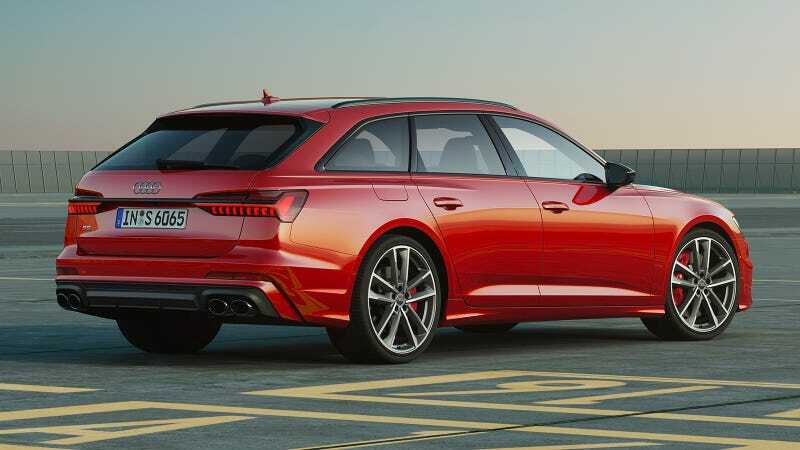 All these things don’t often occur in one car, and this one really is remarkably handsome, so the 2019 Audi S6 Avant TDI is ripe for being worshiped by folks who are into cars. The spec sheet says that the vehicle’s 3.0-liter V6 engine makes 349 horsepower and 516.3 lb-ft. The car weighs 4453.3 pounds and its maximum gross weight is 5853.3, meaning that it could carry 1,400 pounds of passengers and cargo. Audi’s press release explains that the 2019 S6 Avant “has combined an electric powered compressor with a 48-volt primary electrical system,” helping the car make its impressive fuel economy claim of over 36 mpg. It also gets performance-oriented suspension, ceramic brakes and all-wheel steering. Stopped to 62 mph is supposed to be able to happen in 5.1 seconds and the top speed is posted at 155.3 mph. It is truly something majestic to behold.